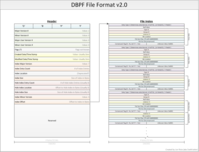 The following contains information about the DBPF file type used for the Maxis game Spore. It was copied from CustomSims3 (Editor's note: as of Sept. 8, 2012, that page was 404 error). // In general, a single linear read of this file type is impossible. // You have to read the index, often (but not necessarily) located at the end of the file. // each chunk, or you can seek from each index entry to the chunk, then return to the index. Some information was taken from old DatGen source code, such as the Created/Modified timestamps and possible Flags DWORD. That information may not be accurate, per DarkMatter's own description. Reason given is that it was some time ago that he "last chatted with Maxoids about the DBPF format." This page was last modified on 8 September 2012, at 23:16.